You can now insert notes in Drawings and Presentations, as you can in Writer. Just choose Insert > Comment. From the spec: "The "Standard Filter" dialog now shows 4 instead of 3 conditions, and has a scroll bar which allows to access up to 8 conditions in total. It now supports the filter conditions 'Contains', 'Does not contain', 'Begins with', 'Does not begin with', 'Ends with' and 'Does not end with'." So you can look for Hansen and Hanson but not, say, Senngard or Pensonner, by using "Ends with" and an OR. 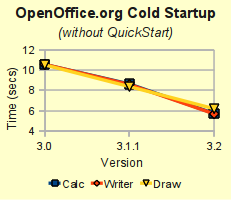 Download the official release for OpenOffice 3.2! And here are the features. All right. This will take a few posts but let's start talking. This isn't the complete list, see that above, but it's the stuff I'm excited about. Faster startup times! Haven't tested but the graph looks great. Some file support stuff: MS Office 2007 passwording is supported. That's a nice reassuring feature. Also 2007 pivot tables are supported. Password protected Microsoft Office XML files (supported document types: MS Word 2007 documents (*.docx, *.docm); MS Word 2007 templates (*.dotx, *.dotm); MS Excel 2007 documents (*.xlsx, *.xlsm); MS Excel 2007 binary documents (*.xlsb); MS Excel 2007 templates (*.xltx, *.xltm); MS Powerpoint 2007 documents (*.pptx, *.pptm); MS Powerpoint 2007 templates (*.potx, *.potm)). OLE objects, form controls and pivot tables can now be read from MS Excel 2007 documents (*.xlsx, *.xlsb). And fonts galore are now available. "There are many high quality commercial and free OpenType fonts that are based on Postscript outlines. They are now supported for formatting, printing, PDF-export and display." Love this. You know how you have 10.001 and you start incrementing and it goes to 11.001? Hah! Not anymore. "If the starting cell for AutoFill contains a number at the start and the end, and there's no space after the first number, the number at the end is now incremented. This allows easier creation of things like lists of IP addresses (10.0.0.1 is followed by 10.0.0.2)." Note that 10.001 still goes to 11.001 as shown below. And this is nice. The cell formats come with the numbers when you sort. "When a cell range is sorted using the "Sort Ascending" or "Sort Descending" toolbar button, cell formats are now sorted with the cells." The info SAYS that you can copy and paste noncontiguous ranges of cells but I can't get it to work. "This feature extends Calc's current copy and paste functionality, to allow copying of a set of multiple non-contiguous ranges. When pasted, all copied data get consolidated into a single range either horizontally or vertically. There are some restrictions when ranges are being copied, in order to ensure that the pasted range become a rectangular range." Download and install. Note that this is still a developer build.